There is no more depressing sight than, when opening a box of your favourite Havanas, you find the cigars inside riddled with holes. It means that you ahve suffered an attack by Lasioderma Serricorne, to give it the scientific name, otherwise called the Tobacco Weevil, the Tobacco Beetle or El Perforador del Tabaco as it is known in Cuba. Your problems may not end with the loss of a single box of cherished cigars because the average life cycle of these bugs is between 45 and 90 days, subject to ambient conditions, and they may have spread to other boxes in your collection. Weevil is endemic throughout the tobacco industry. Cigar manufacturers not only fumigate their warehouses, but also use vacuum chambers to crush weevil eggs lying dormant in their finished products. Nevertheless live weevil as eggs, larvae, pupae or adult insects can and do survive. It is as larvae, a stage lasting between 5 and 10 weeks, that they do damage by boring through the cigars as they eat and excrete the tobacco. As pupae they lie dormant and as adults they live for only a month during which they mate, lay eggs and the whole cycle starts again. It's not always easy to tell whether cigars have weevil because the larvae may not have penetrated the wrapper. However one useful guide with a labelled box is to examine the paper hinge inside the lid. You will often find bits of tobacco in this position but you should be suspicious when there is a deposit of fine, brown dust. If you see some, the next step is to examine all the cigars for holes and finally to tape the foot of a cigar on the lid. Often this will produce a shower of dust from inside where a weevil has been at work. When you find an infestation, what do you do? 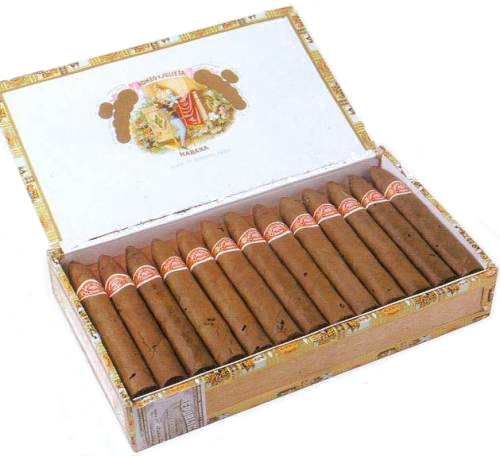 The first thing is to isolate the cigars by putting the whole box in a sealable plastic bag. Whilst a blast of insecticide would probably clear up your problem, it would also render any cigars, which might be saved, unsmokeable. You are better advised to place the whole box in the deep freeze. Weevils hate the cold and four days in the freezer will destroy them no matter what stage they are in. It won't help the cigars much either but, provided you thaw them out gently by first putting them in the main section of the fridge before bringing them back to room temperature, they should still taste acceptable. How can you be sure that the infestation is confined to one box? 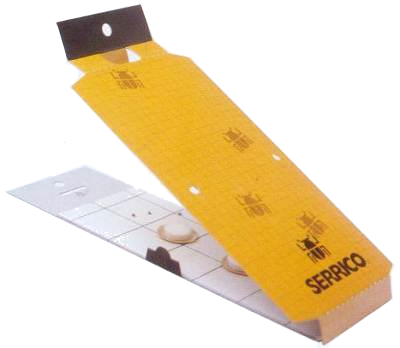 This is not easy but the Fuji Flavour Company in Japan has an answer in the form of their Serrico weevil trap. This is a glorified fly paper, which targets the weevil by the addition of two patented pills, one of which fatally attracts the female bug and the other the male. It is important to note that these devilish devices will not eradicate an infestation but they will indicate whether you have one and where it is. The only long term solution, as the Voges Tobacco Encyclopaedia puts it, is 'scrupulous hygiene' combined with ruthless removal of all infected cigars. Then, after about a year, your stock can be declared weevil free. One lesson we should all learn from this is the importance of buying your cigars from a reputable source. Whatever you do, never buy Havanas on the streets of Havana. Counterfeits are a virtually guaranteed source of weevil because black market manufacturers do not treat their tobacco. Also remember that even if a box is shipped weevil-free from its source, it can become infected through careless storage alongside other infected cigars. In the UK you are best advised to stick to EMS Havanas because you know the cigars have been stored properly and checked by experts. Egg: White in colour, 0.5 mm long, hatches in 6 to 10 days, viable for 35 days. Larva: Starts white then grows brown hairs, 4 mm long, feeds for 5 to 10 weeks, subject to temperature. Pupa: Brown in colour, 4 to 5 mm long, pupation lasts 2 to 3 weeks. Adult Insect: Reddish brown colour, 2 to 3 mm long, hairy body, hump back, lives about a month.